Reverse sneezing is a fairly common respiratory event seen in dogs, and it affects cats as well, but it's rare. While harmless, it can be quite alarming for dog owners to witness because it sounds more like a goose honk than a typical dog noise. But what exactly is a reverse sneeze and what causes it? Medically, reverse sneezing is called inspiratory paroxysmal respiration. It is caused by a spasm of the laryngeal area and soft palate. It is termed "reverse sneeze" because the dog is forcefully and rapidly inhaling air. With a regular sneeze, the air is expelled. The inhalation of air can be quite forceful, leading some owners to rush to the emergency clinic. A reverse sneeze can last from a few seconds up to a minute or two. During an episode, the dog is usually very still with his head and neck extended. Once the episode is over, the dog resumes normal behavior. Smaller breeds, such as toys and terriers, are more prone to reverse sneezing and may have several episodes a day. 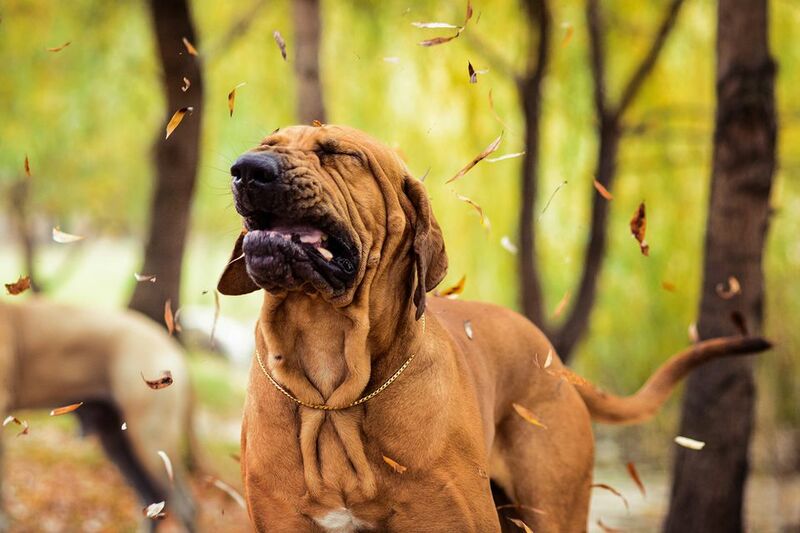 Some dogs will experience reverse sneezes throughout their life while it may be only an occasional event for others. Reverse sneezing is caused by irritation of the throat, pharynx, or laryngeal area. Any number of things can cause this. However, it is not uncommon for the cause to remain unknown. For instance, in some dogs, it will occur when they get excited or when they pull on the leash. For some, a sudden change in temperature—moving from a warm house to frigid outdoor temperatures—can also trigger the sneeze. It can also happen if they inhale irritants such as pollen or strong odors, or if they have allergies. Some dogs are more sensitive than others to items such as perfume, household cleaning products, and similar things that have a strong fragrance. For this reason, a chronic reverse sneeze should rule out any potential environmental triggers. A reverse sneeze can also be caused by respiratory infections, post nasal drip, obstruction or inflammation of the nasal passages, or excess in nasal discharge. Though it's less common, pneumonia, a gastrointestinal disease, nasal tumors, or dental diseases may also be a cause, particularly in older dogs without a history of reverse sneezing. If the reverse sneeze becomes a regular occurrence, it's best to schedule an appointment with your veterinarian for evaluation. They may be able to narrow down any potential causes to see if the situation improves. A vet visit should happen as soon as possible if you notice prolonged bouts of reverse sneezing or bloody or yellow nasal discharge. For dogs, the vet is likely to try and rule out conditions like grass awn inhalation, collapsing trachea, kennel cough, and respiratory infections. For cats, the vet will want to look for feline asthma and upper respiratory infections. Reverse sneezes are self-limiting and usually not treated with medication. Depending on the cause, the vet may recommend an antihistamine, though that is often only in the cases of allergies or chronic bouts. For the occasional reverse sneeze, you can offer your dog some comfort. One common method people use to hold the dog's nose while gently massaging the underside of his throat for a few seconds. You will notice that the dog will swallow a couple of times during this process. The goal is to calm the dog and promote airflow. Fresh air or, in the least, a change of environment can help as well. Most importantly, stay calm. The reverse sneeze is typically not a serious issue, but a momentary episode that will pass. However, you should raise any concerns you have with your veterinarian.